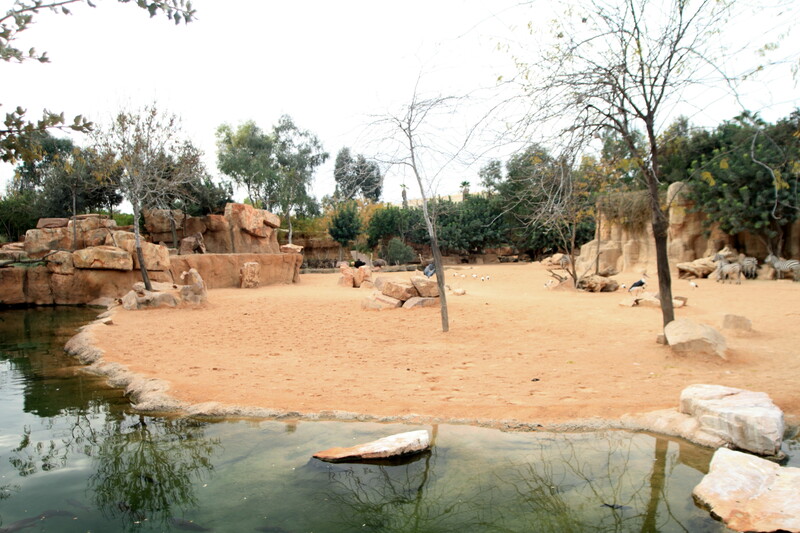 This week I decided to try to show the size and layout of the Bioparc, although I have mentioned features of it in previous writings this time I will try to show the whole thing. The parc itself covers an area of 100,000 square metres, however this figure is fairly meaningless to most people, even if I said that is about the size of 14 football pitches, it is still hard to visualize. 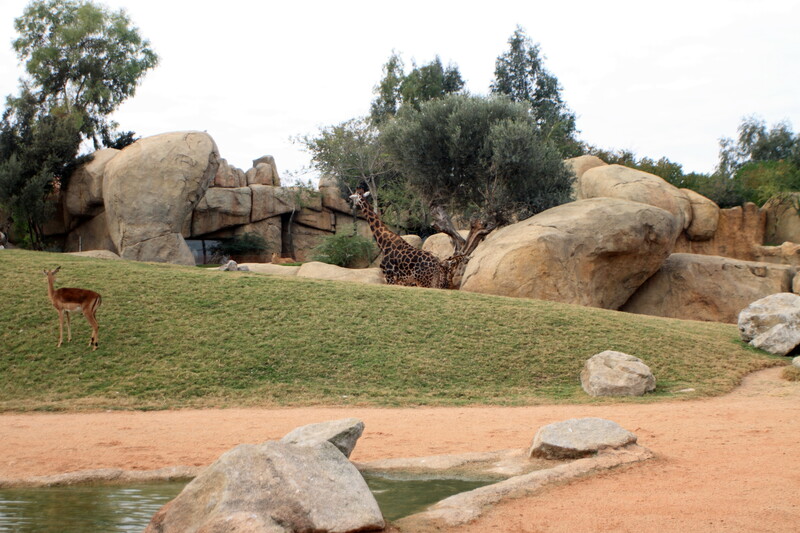 What makes it even more impressive though is the design which features no physical barriers and plenty of open space, mimicking the animals real habitat. The following map gives a good starting point. 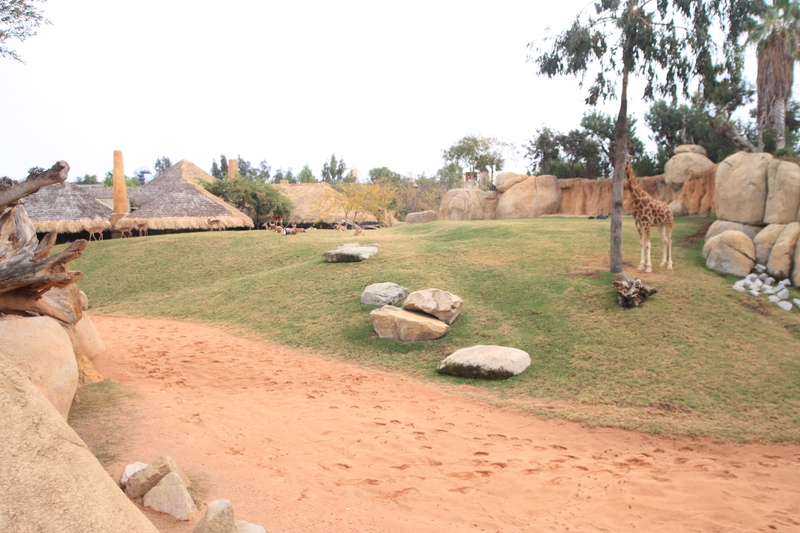 The grey areas are the footpaths and access points for the public, the beige area represents the open plains of the savannah, the green area the forests and the orange area is the Lemur enclosure. 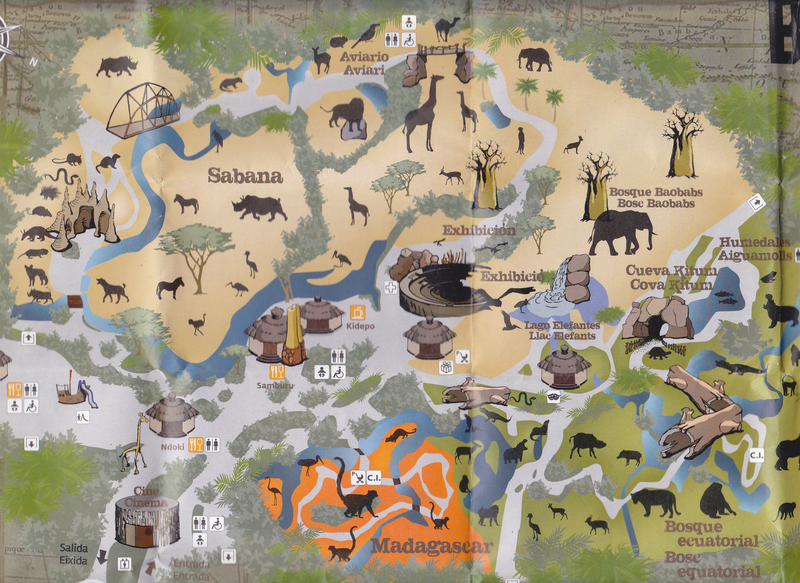 The whole thing is centred around the two separate “savannahs”, one housing the Waterbuck, Impalas, Blesbok, Gazelles and the Giraffes as well as several birds, Ibis, Crowned Cranes, Storks and Ducks. 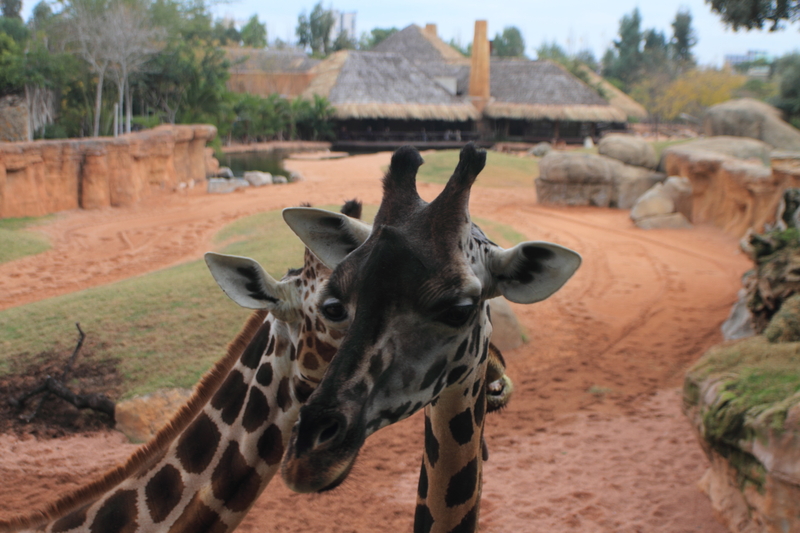 The thatched building behind the friendly giraffes is the cafeteria and restaurant, with the cafeteria terrace being directly above the giraffes head. It is truly wonderful to be able to relax in the sun, drinking coffee (or beer) looking out over the lake as a small herd of giraffes saunter past. 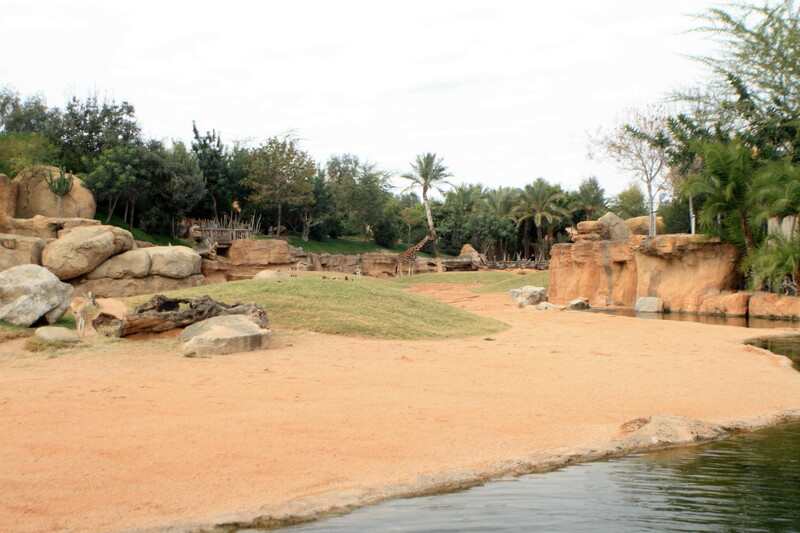 In the first photograph you can also see the Lion enclosure in the background, which for obvious reasons is separated from the savannah. 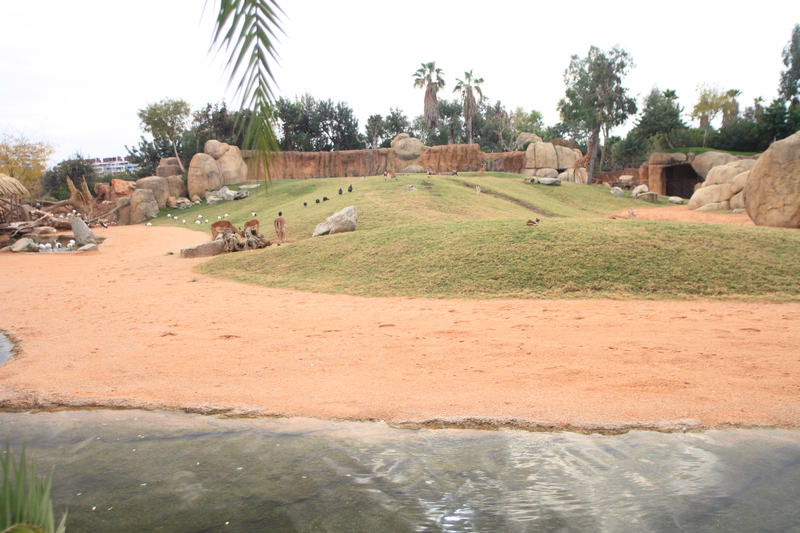 The other large area of savannah is also separated by an artificial rocky terrace and this houses the Zebras, Ostriches and Rhinoceros´. 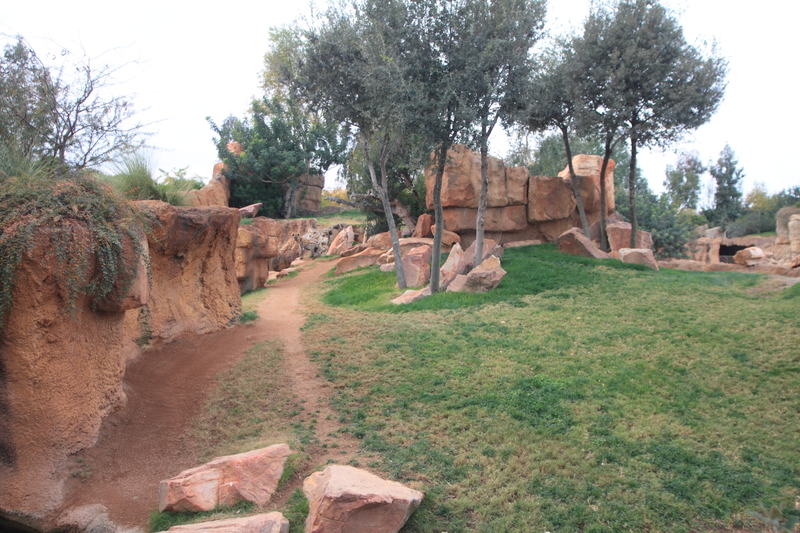 Walking round in a clockwise direction past the Rhinos come the Hyenas, which have a reasonable sized area, separated from the public by a small ditch, which I never feel is big enough! 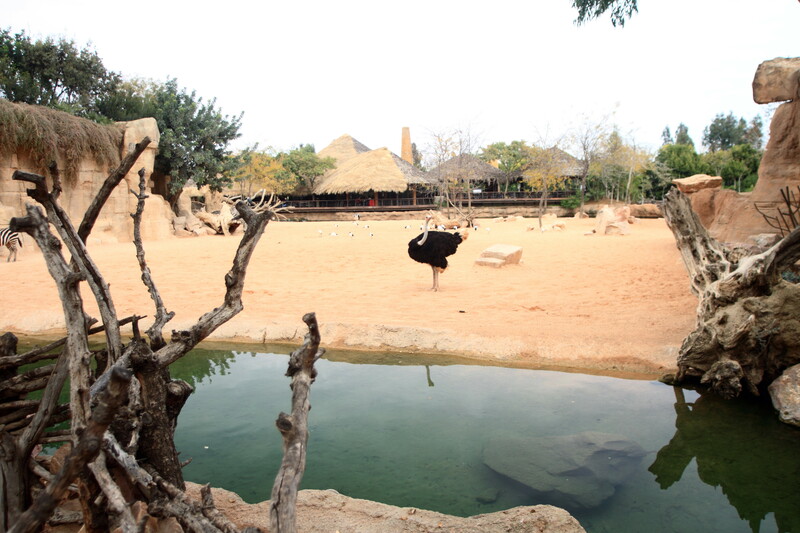 Whilst on the left are Warthogs and a cave area with Aardvarks and many different types of rodents. Further round is a separate Rhinoceros (a subject for future blogs) and a walk through aviary before arriving at the lion enclosure. 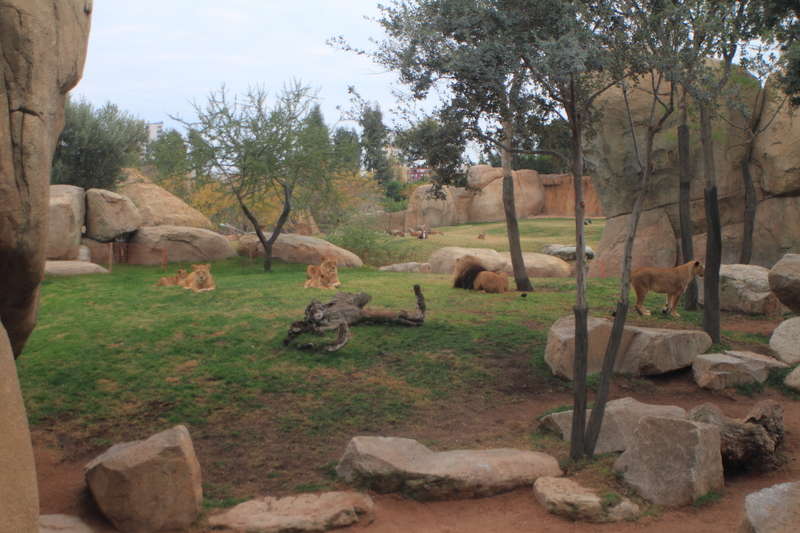 Its not the hundreds of square kilometres a Lion is used to in the wild but big enough, and interesting enough to be adequate I feel. 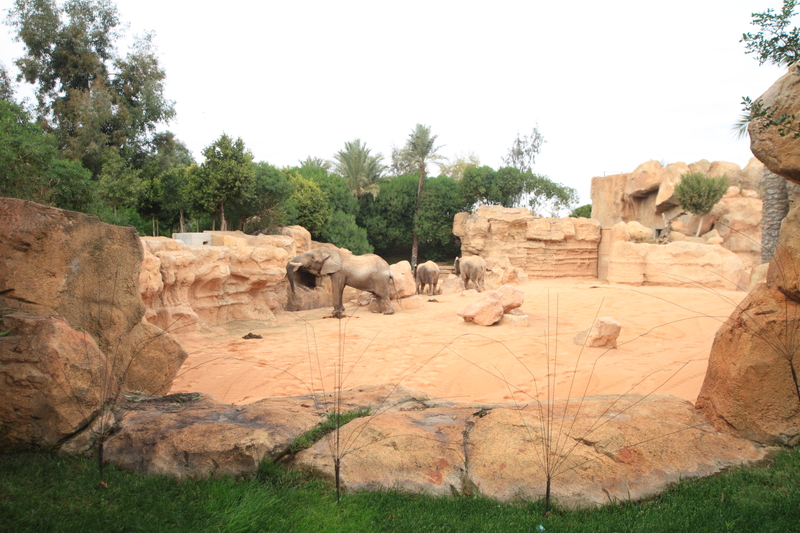 By now we are directly opposite the restaurant and come to a small area for the camels, this does not seem big enough but they have been moved out of their original home to accommodate the bull elephant and his two companions with whom they hope he will breed. 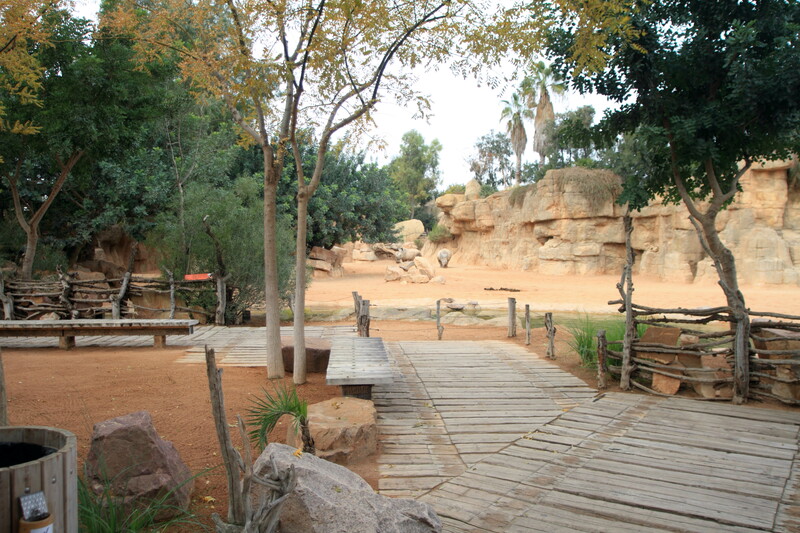 This is separate from the main elephant enclosure which is one of the biggest areas but much is hidden by rocks and fake baobab trees. Past the exhibition arena, we then come the forest area, which actually does not contain that many trees. 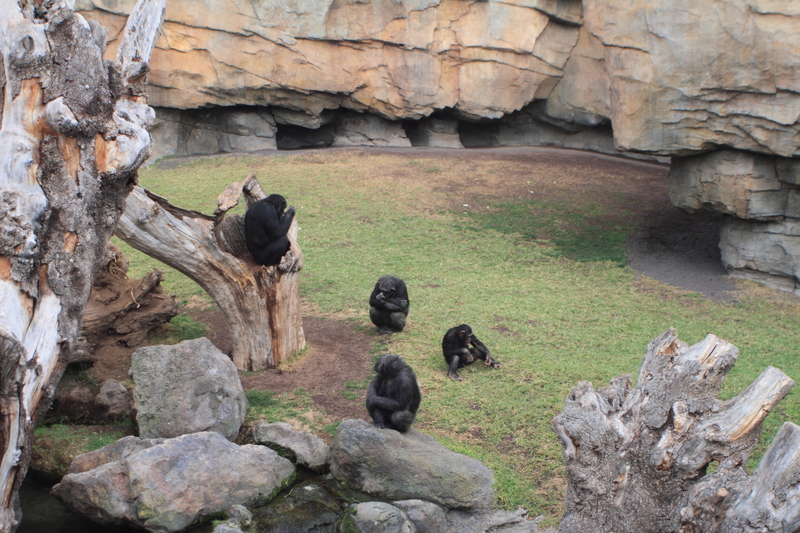 disappointing for the Chimpanzees and Gorillas but not for the public who, otherwise, would not be able to see them. 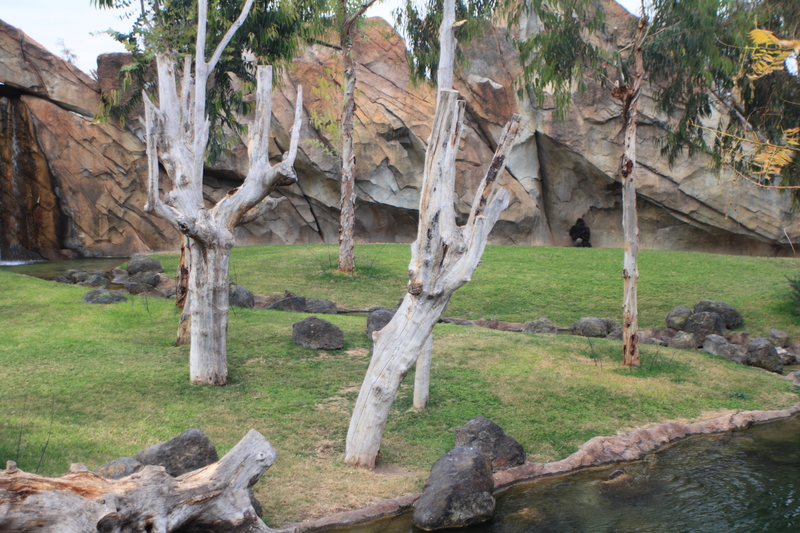 The two sets of Gorillas each have a fairly large area but, as I have said, it is fairly open and the silverbacks choose to stay near the corner by their caves. 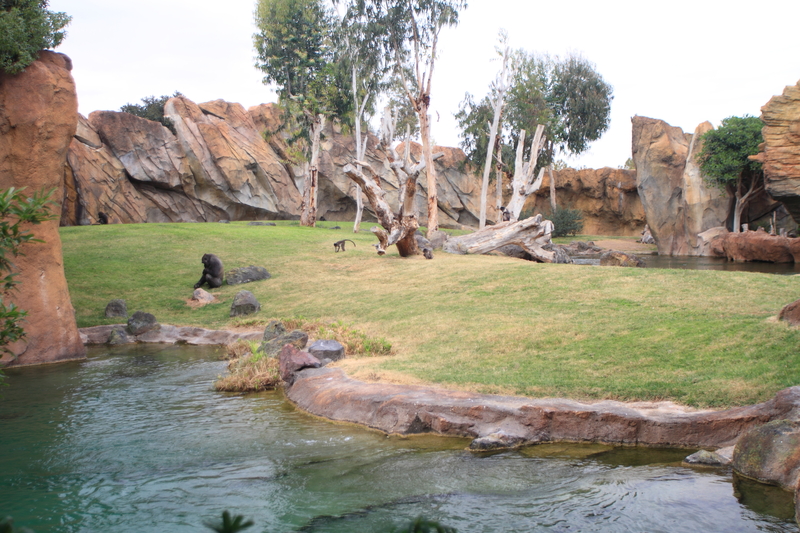 The Chimpanzee group also have a large but open area. 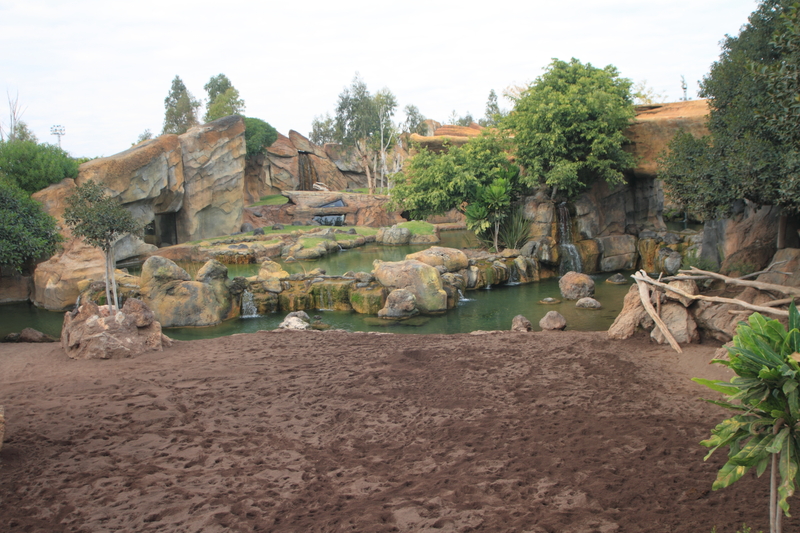 There is quite a bit of water around the primates and I have seen one of the Gorillas dipping into the water to cool down. Worryingly this is all that separates them from the public so hopefully they will not get too adventurous. 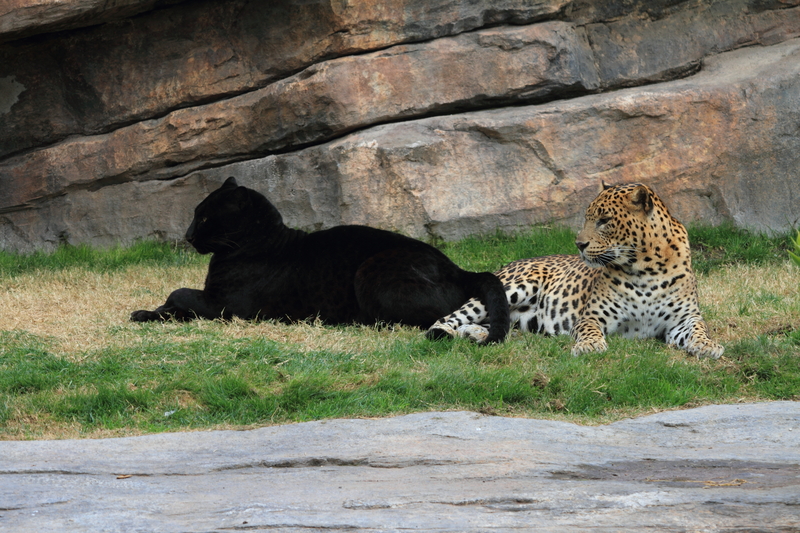 At this point I must include some photos of the two Panthers which were relaxing in the sun together and show just how similar the black and spotted panthers are. 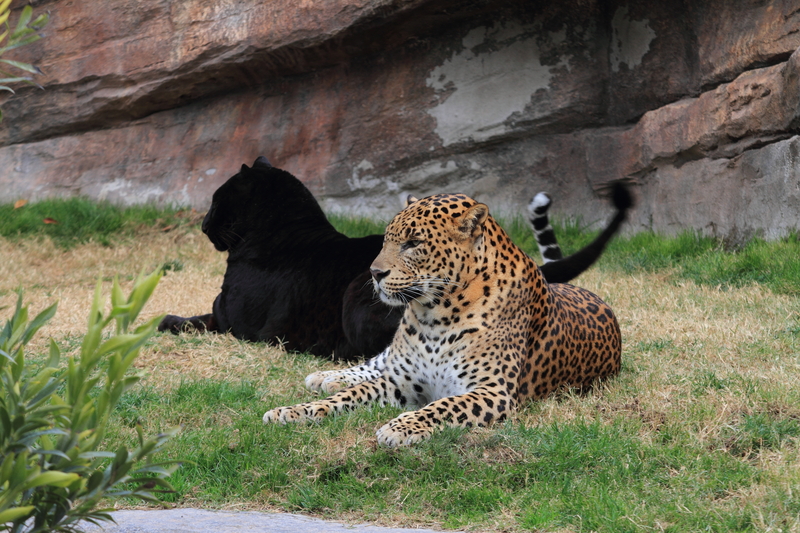 They are in fact the same species just with different colour pigmentation. 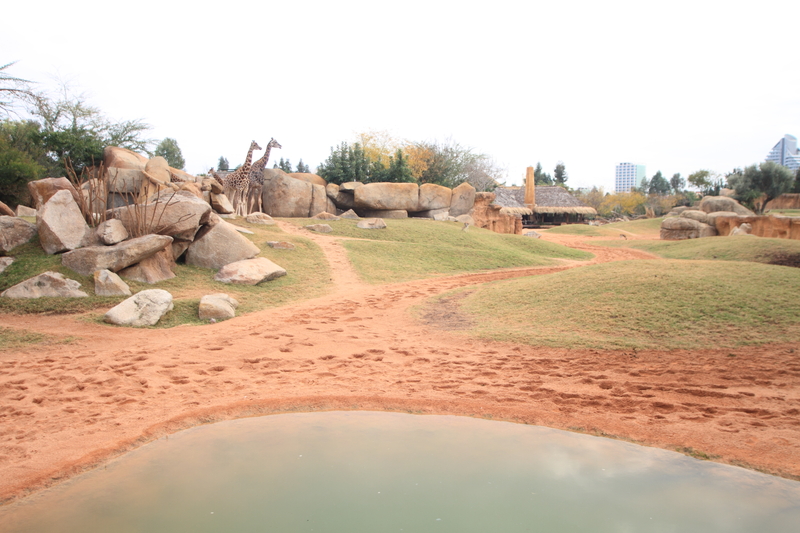 This part of the parc has several water features with Red Buffalo, Sitatunga, Drill, Pigmy Hippos, Bongos and Red River Hogs in various enclosures. 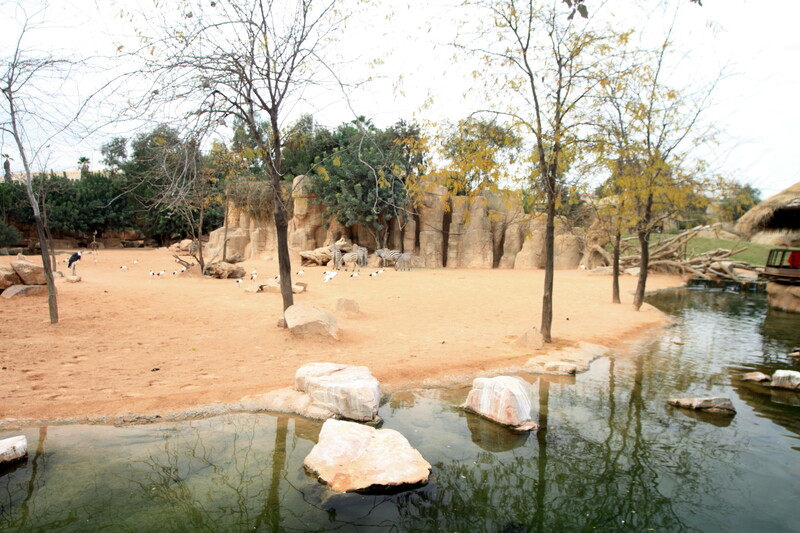 Finally is the area called Madagascar which is home to the Lemurs and where there is a small dense forest area and a more open space. The Lemurs are free to go where ever they want, including on the public footpaths, which makes for an exciting spectacle as they scamper across the path directly in front of you. Hopefully this has given you an idea of how the parc looks. 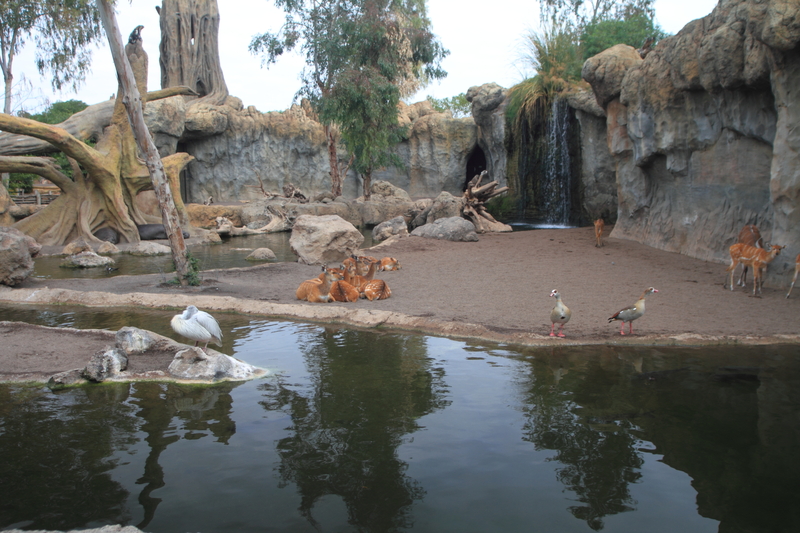 Most of the animals seem happy here and the breeding programme is going well, which must mean something. Over the Christmas period the timing of these blogs will inevitably become erratic but I will try to go a few times and will then resume my regular Wednesday slot after the Three Kings celebrations in January. 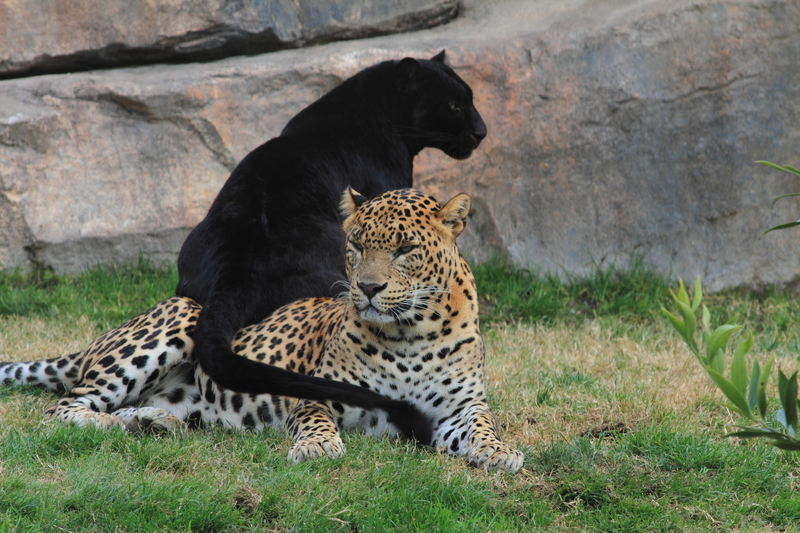 Have a very enjoyable festive season, and I hope the animals do too.